Reviews and photos of exclusive runway shows and fashion presentations. On July 11, Brooklyn raised designer Romeo Hunte presented his first men’s ready-to-wear collection, Spring Summer 2019 “Luxury streetwear meets swimwear”, during New York Fashion Week: Men's Spring Summer 2019. The runway show took place at PH-D Lounge in the Dream Downtown hotel. Hunte, a former athlete, pursued his dream to become a fashion designer. His motto of is "always believe in yourself and keep pushing". His brand, representing women’s & men’s wear, is appreciated by many. Among them lots of celebrities like Beyoncé and Halle Berry! His designs can be described as classic, modern and innovative! 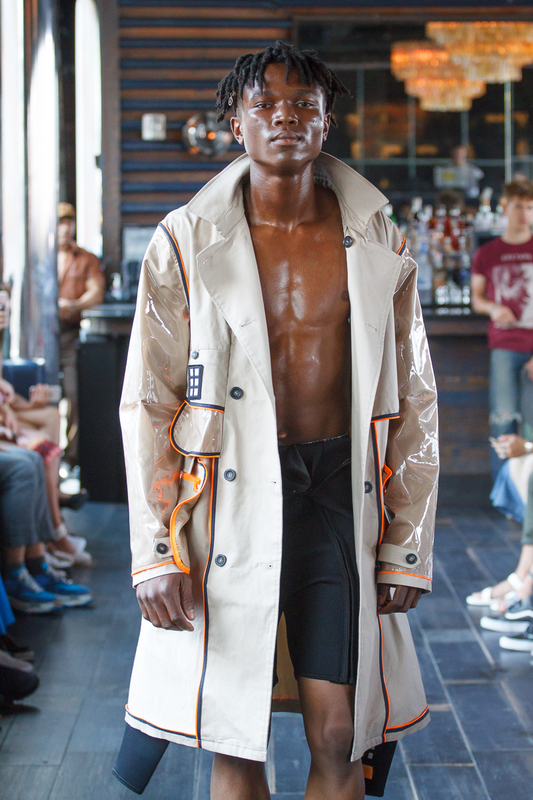 He mixed and matched fabrics like mink fur, denim and neoprene what resulted in a powerful and distinctive collection. This creative designer successfully mashed up lots of unexpected elements together, such as denim cotton coats, trench coats, bomber jackets and surf swim suits. The red, blue and yellow neoprene vest was certainly an eye-catcher. For this collection Hunte had, among others, teamed up with Teva (footwear). Wear for the sportive and adventures man. Other cool and ready to go pieces were the camouflage jackets and extra layered bomber jackets. Surprisingly nice was the trench coat with blue and orange edges. And have look at the plastic sleeves! Urban chic! 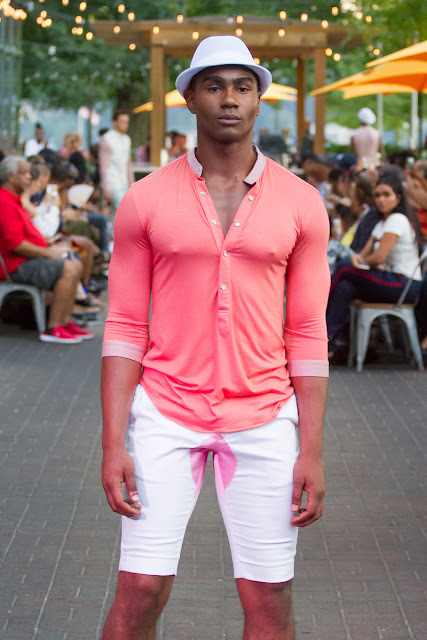 Model walks runway in an outfit from the Edwing D'Angelo Spring Summer 2019 "Pristine"
during New York Fashion Week: Men's Spring Summer 2019. A few miles north, also on the island of Manhattan, Colombian born, appraised designer Edwing D’Angelo presented his Spring Summer 2019 “Pristine collection” menswear collection. 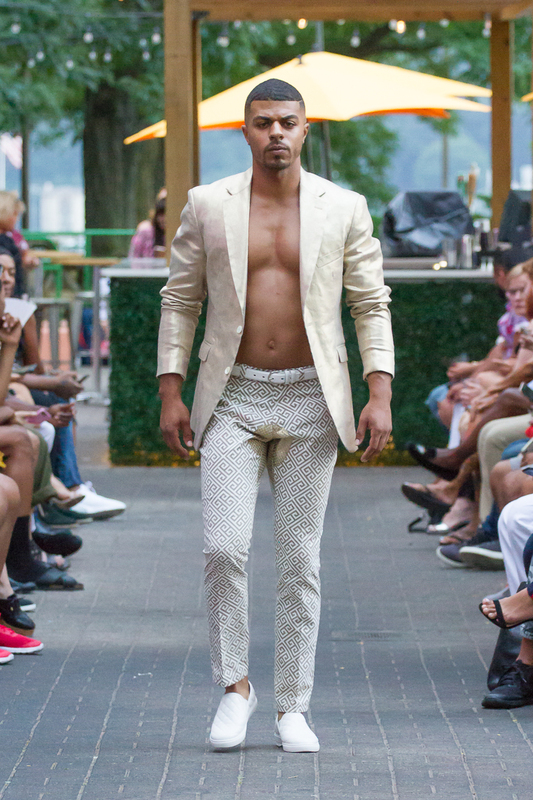 This runway show was held at Sofrito in Riverbank State Park. The scenic outdoor location provided a lovely backdrop as models walked the runway in fresh and clean designs. Wearable high end fashion for confident men! Fedora hats, jumpers, pants with patterns in the crotch area in white, soft pink and gold tones. Floral prints and patterns mixed and matched; this collection is absolutely daring. 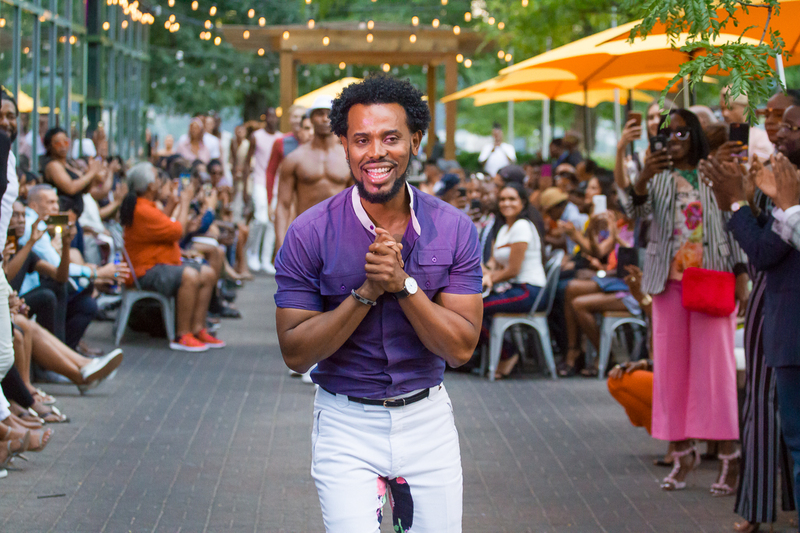 D’Angelo himself proudly yet humble received the applause while walking the runway in a cool purple & white outfit. Fashion designer Edwing D'Angelo thanks audience for attending his Edwing D'Angelo Spring Summer 2019 "Pristine"
Hello, I am a New York City based photographer and pencil artist. I love to photograph and write about fashion. Since 2008 I've had the privilege to cover hundreds of fashion shows by internationally acclaimed designers, as well as emerging local designers during New York Fashion Week, Bridal Fashion Week, Kids Fashion Week, Men's Fashion Week, Fashion Week Brooklyn and many others. This platform provides fashion experts as well as lay people a visual glimpse and intellectual understanding inside the world of fashion, luxury, creativity and beauty. Readers get to view the latest looks from runway, hottest beauty trends backstage, and learn about the inspirations behind collections in the designers' own words.